Moderately large, slender, cylindrical minnow with a rather large, nearly horizontal mouth. Small conical barbel present at corner of mouth. Back and upper sides are olive-brown with large, dark-edged scales, giving a cross-hatched effect. Lower sides and belly are yellowish-white. Males commonly have tubercles (bony projections) on top of head and a prominent red spot behind the eye. Similar in appearance and ecology to the redspot chub, which has a more limited and separate distribution. Total length: 5 to 7 inches; maximum about 10 inches. Clear Ozark streams with permanent flow and clean gravel. Adults are found near riffles while young are usually found in pools, often hiding within plants. Omnivorous, feeding on both plants and animals. Prey animals are mostly insects. 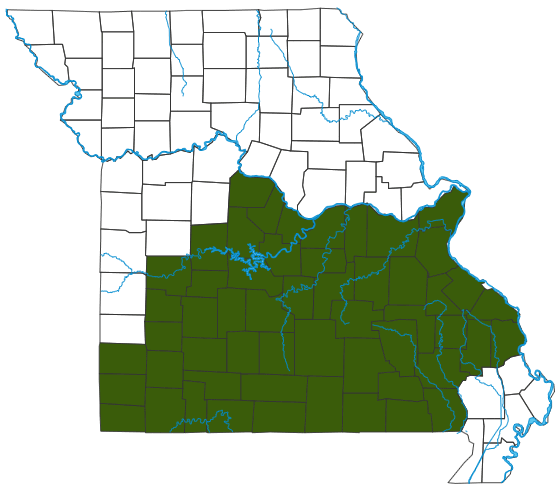 Occurs in all principal stream systems of the Ozarks not occupied by the redspot chub. Lifespan can be 3 or 4 years. Most active in daytime. In late spring, males build conspicuous mounds of gravel 1 to 3 feet in diameter on which to spawn. Numerous other minnows use hornyhead chub nests for spawning.